Publication details: Book. 2004. xii and 403 pages. Publication date: 2004-04-16. 160 figures and 46 tables. Hardbound. 16x24 cm (6.3x9.4 in). 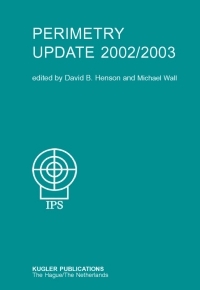 Perimetry Update 2002/03 contains a selection of paper presented at the 15th Visual Field Symposium of the International Perimetric Society (IPS) meeting held in Stratford upon Avon, England, from 26-30th June 2002. The meeting, titled 'Perimetry and Imaging in Shakespeare's Country', was hosted by Professor John Wild of Cardiff University. The meeting included the 2nd IPS lecture given by Professor Erik Greve, titled 'I come to praise perimetry' which led delegates through an entertaining history of the IPS from its conception and first symposium in Marseille, 1974, through to its future in an ever demanding health care environment. This was the first IPS symposium to incorporate sessions on imaging. The research focus of many members of the Society is the detection and management of glaucoma and their research interests frequently incorporate both perimetry and imaging of the optic nerve head. It was, therefore, felt appropriate that the symposium should broaden its remit to cover imaging of the optic nerve head. Two of the 15 scientific sessions were devoted to this topic with papers covering new developments/findings with the Heidelberg Retinal Tomograph and the GDx Scanning Laser Polarimeter as well new ideas in the presentation and analysis of optic nerve head images. The meeting had a further 13 scientific sessions devoted to perimetric research. These sessions covered a wide range of topics including new technique, variability and basic science. Two sessions were devoted to variability, which has become a major topic for perimetric researchers. Contributors benefited from wide ranging discussions of their work both during the scientific sessions and the accompanying social events. These proceeding will be available in digital format, along with all the other published proceedings, through the IPS web site: http://webeye.ophth.uiowa.edu/ips/ This site also contains much useful information about the Society with a comprehensive set of links to eye resources on the internet. support and to Patrice Henson for secretarial work. Finally, a very special thanks goes to John Wild for his organisation of the Stratford meeting and to Michael Wall and Richard Mills for their continued commitment to the Society. The next IPS symposium is to be held in Barcelona from June 29th to July 2nd 2004 and the plans for that meeting are already well advanced with Dr. Francisco Javier Goñi acting as the host. Does patient education result in more reliable initial visual fields?